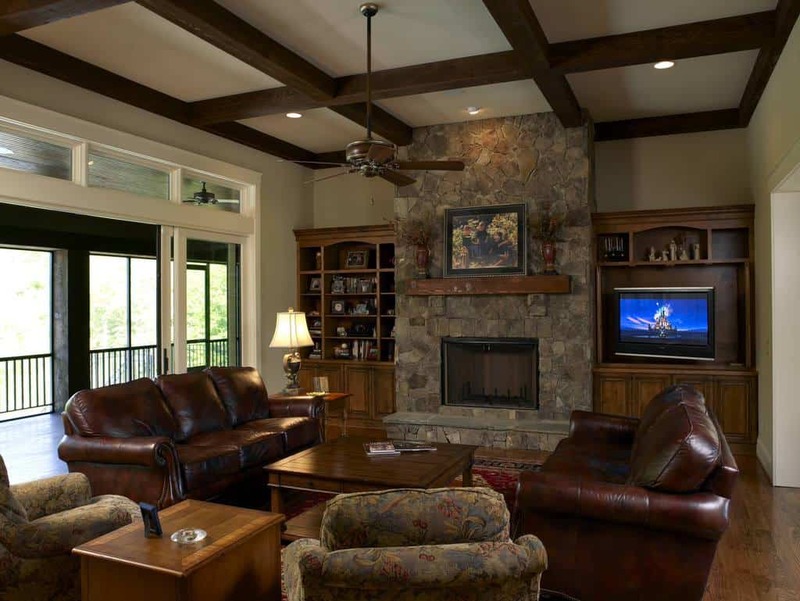 A family room is a place for you to relax, whether it is in the morning, afternoon, or evening. Don’t settle for a family room design that you won’t love for a long time to come. But, how do you choose the right style? 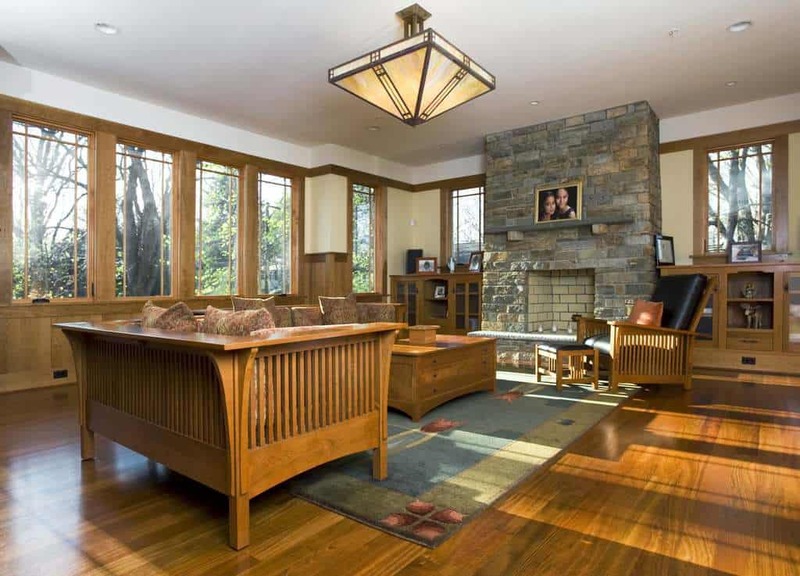 Even with so many options, a craftsman style may be something you fall in love with. 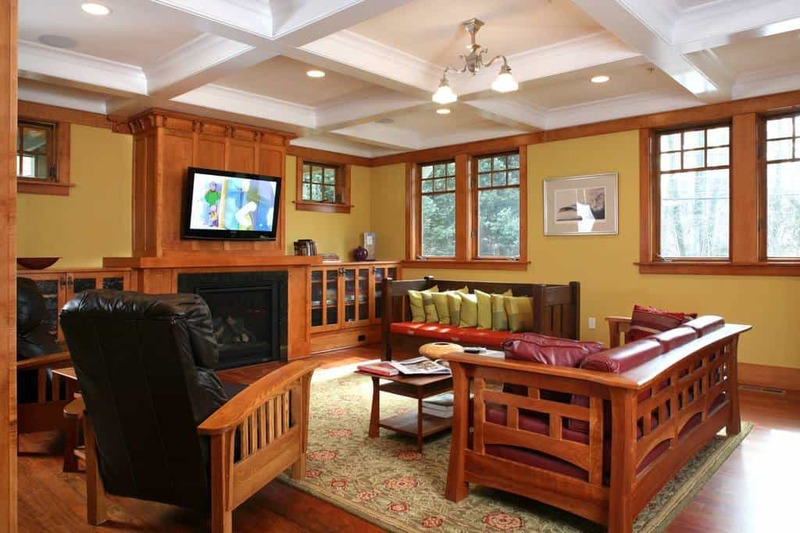 Below, we have gathered 20 craftsman style family room ideas for you to browse through. You can see just how many options you have, no matter what size room you are dealing with. Let us help you create a room you will love. 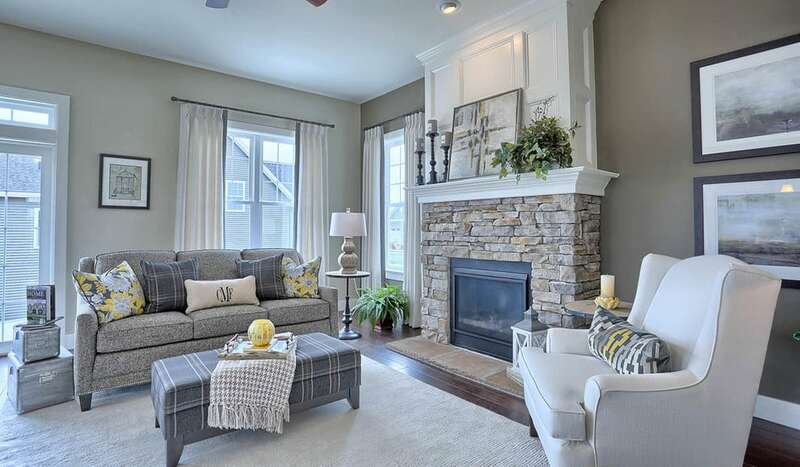 Designed all around this beautiful fireplace, this room is open and stylish. The decor is beautiful but minimal, making this a calm space. Great natural light shines into this room. 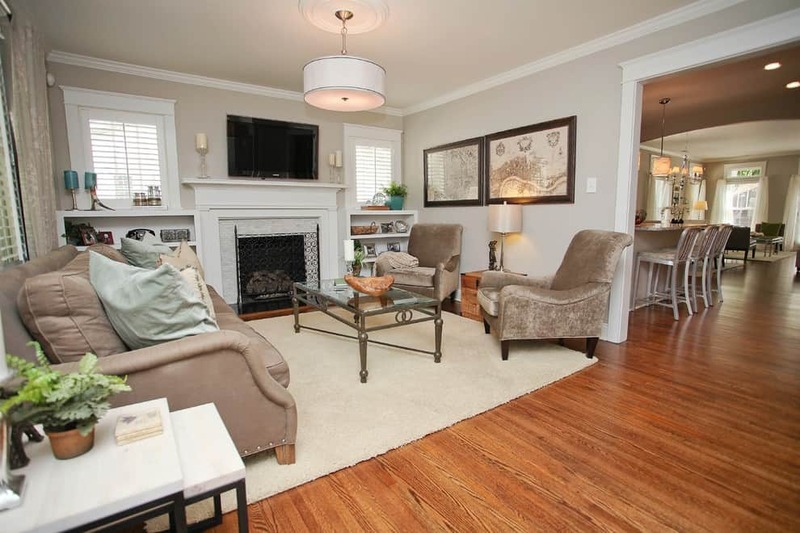 This family room is connected to the kitchen area and gives you a great place to come and relax. The light blue walls let you use great decor to match, making this a contemporary space with some traditional styles. 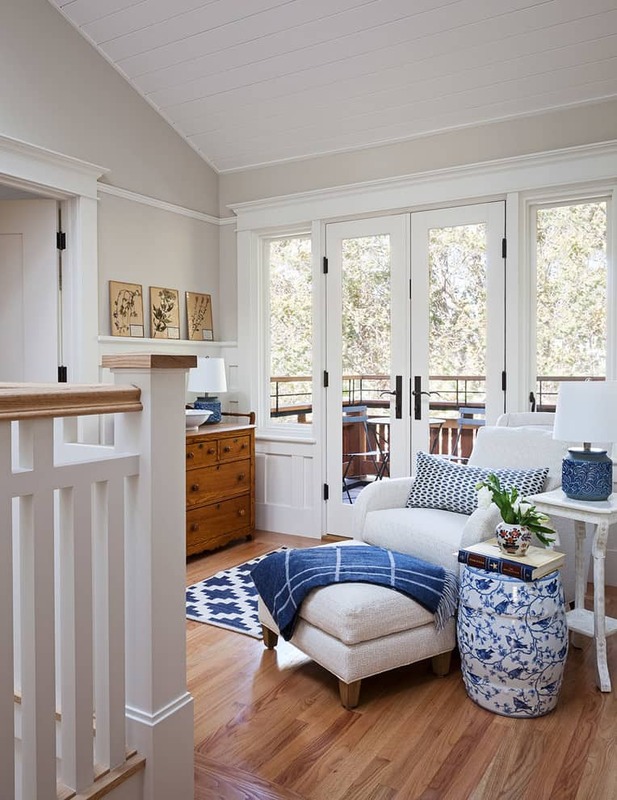 To go with the light hardwood floor and the light walls, this space has some great blue styles and patterns. Opened easily to the outside deck, you have many options for relaxation here. 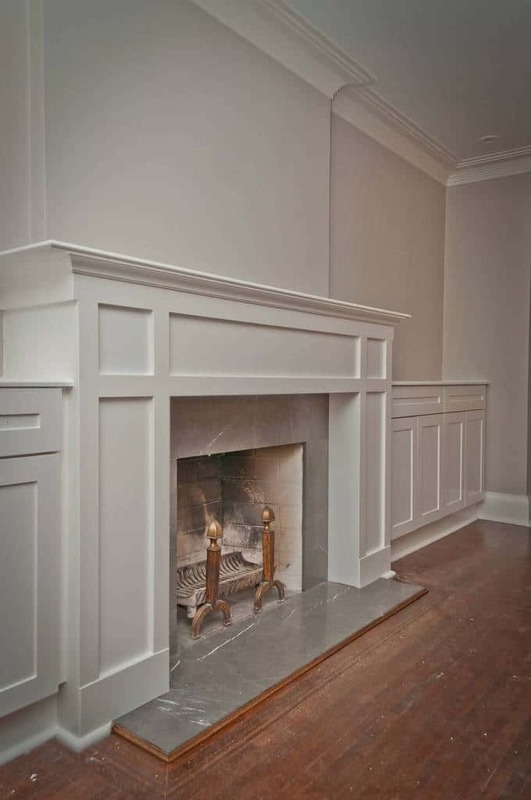 The light bricks used for this fireplace give you a great base to design around. This room uses furniture and calm, light artwork to create a room that has a cool sense of style. It is calming and welcoming. 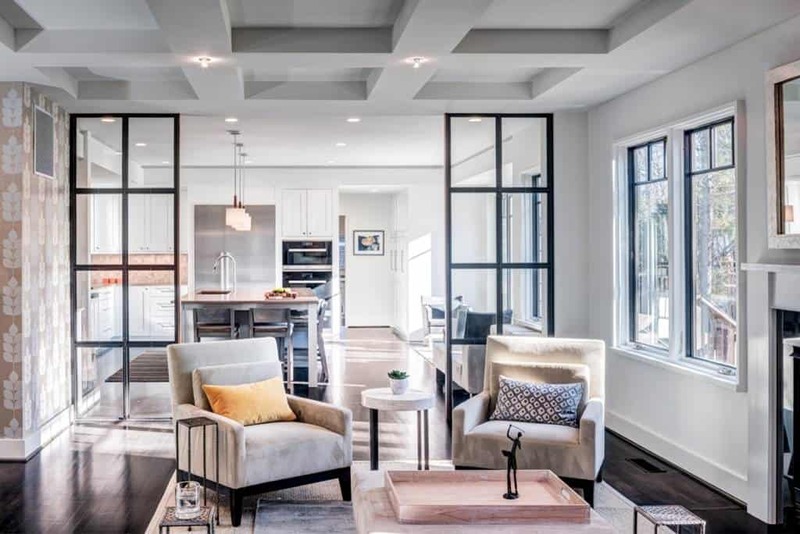 Photo by Krieger + Associates Architects, Inc.
With an eye for sophistication and a warm style, this handsome room has a warm sense that you will love. 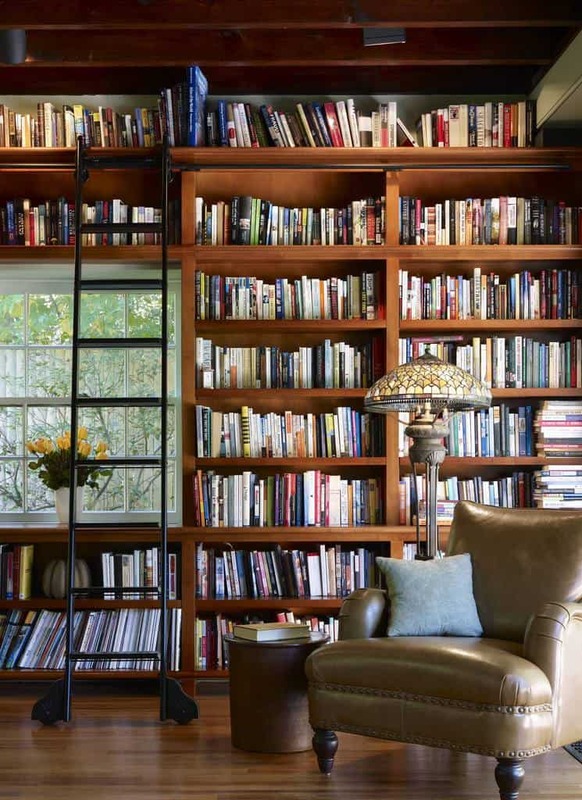 Grab a book down from the shelf and relax for a while. This corridor connects the kitchen area with a great family room space. 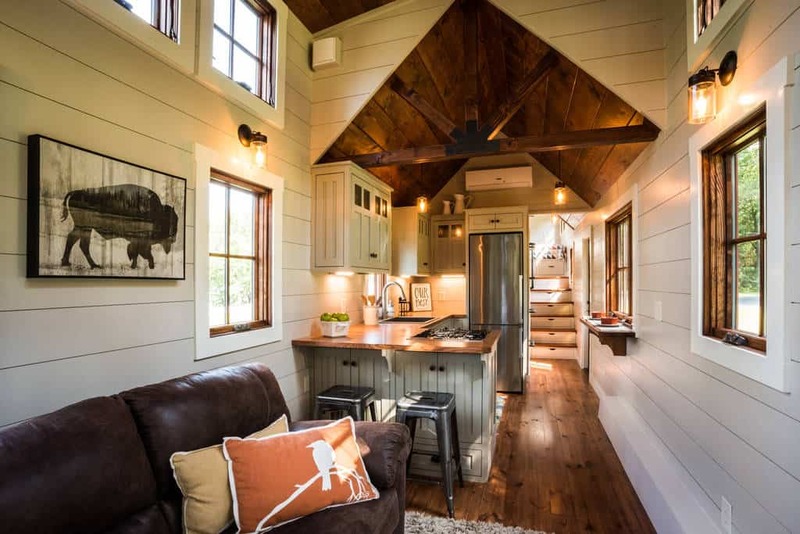 The western style of decor is carried throughout, using beautiful hardwood architecture. With warm colors and a great patterned rug centering this room, you can sit back and relax. 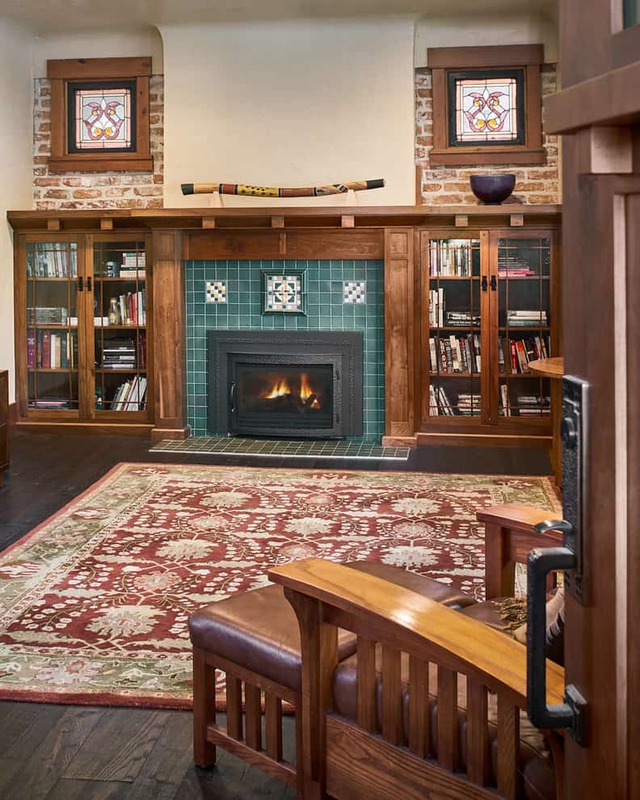 The decor has a cultural sense of style and the tile design around the fireplace fits this room perfectly. 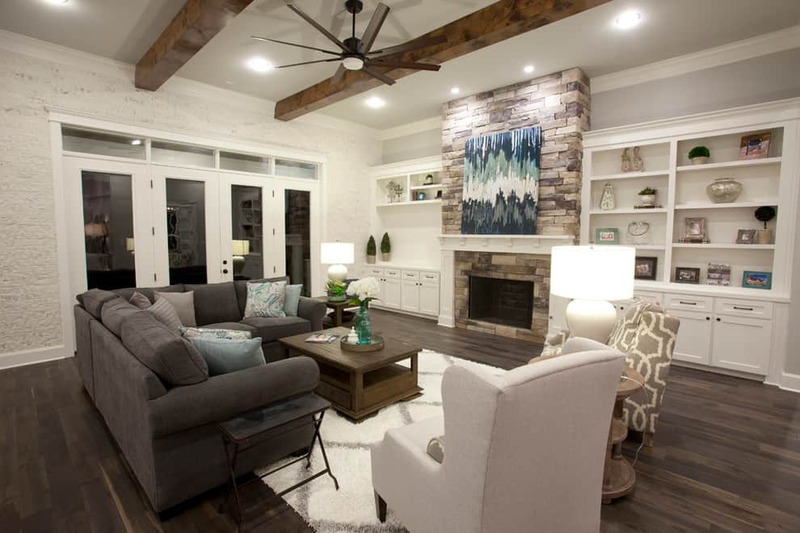 The stacked stone fireplace blends perfectly with the hardwood beams running along the ceiling. You have beautiful darker furniture to match the hardwood shelves. 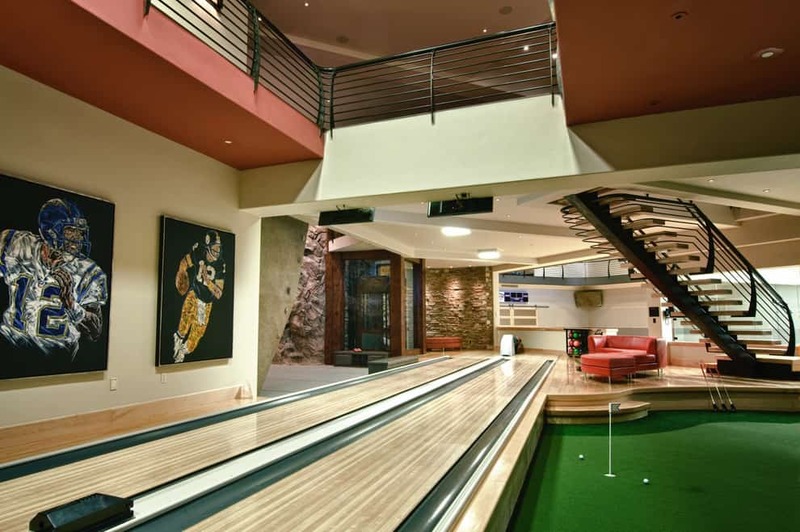 If you are a serious gaming fan and want to keep your guests entertained when they come over, a room like this is the way to go. The whole space is open so everyone can do separate things and still be together. If you have some business buddies or friends that love to golf, bring them here for a great simulated game or some practice. 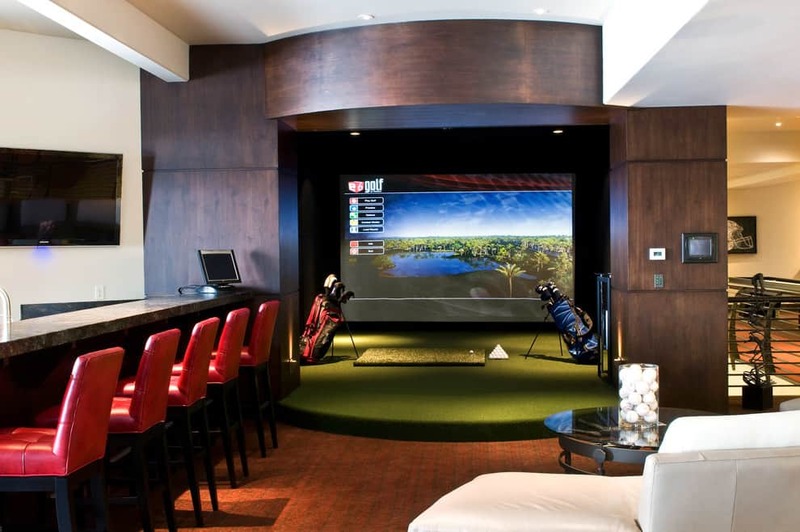 Pull up a chair at the bar and grab a drink in between holes. The shade of gray used for this wall is such a great fit for this hardwood floor. This is a traditional design that will allow you to create a wonderful space, using a wide range of furniture and decor. 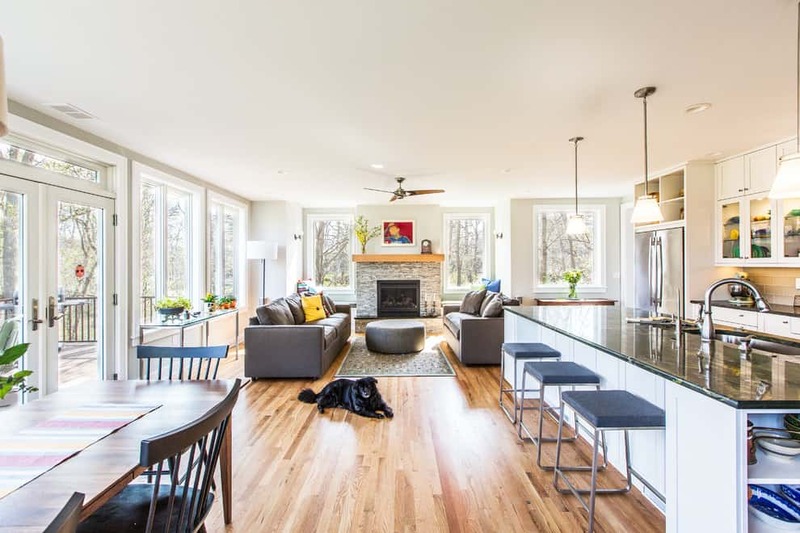 Photo by Mike Pardue Homes, Inc.
With a contemporary design at work to enhance this beautiful hardwood floor, you can see true luxury. 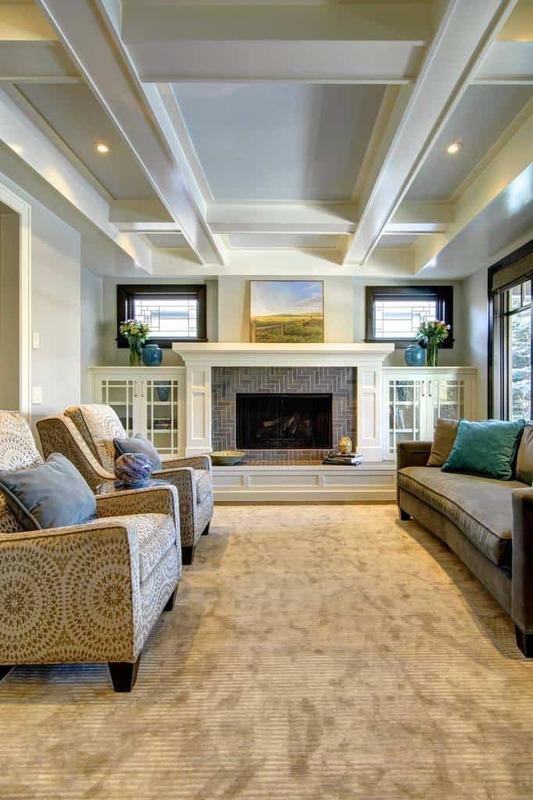 The stone fireplace is perfect to match the ceiling beams and the furniture is a blend of patterns that works. 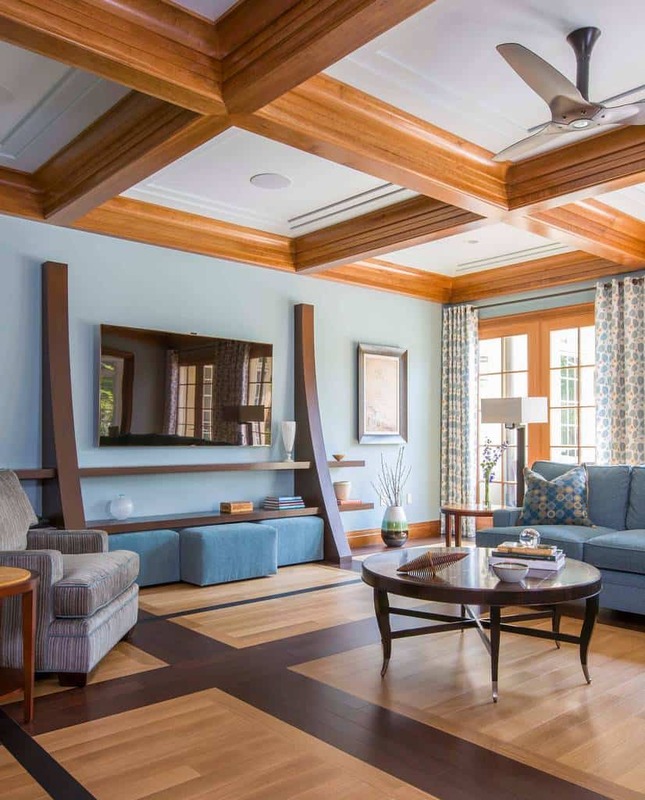 The hardwood floor in this family room is wonderfully matched by the furniture. The natural light shines in to show off this beautiful fireplace, creating a warm and welcoming environment for everyone. 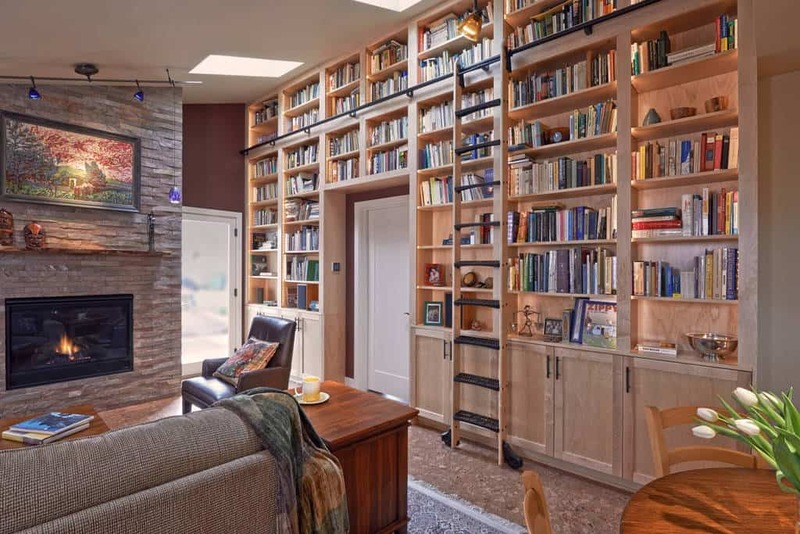 The first thing that catches your eye is a wall full of books and beautiful decor. This room breathes sophistication and charm, with contemporary styles and bold designs. Hardwood doesn’t have to just stay on the floor. 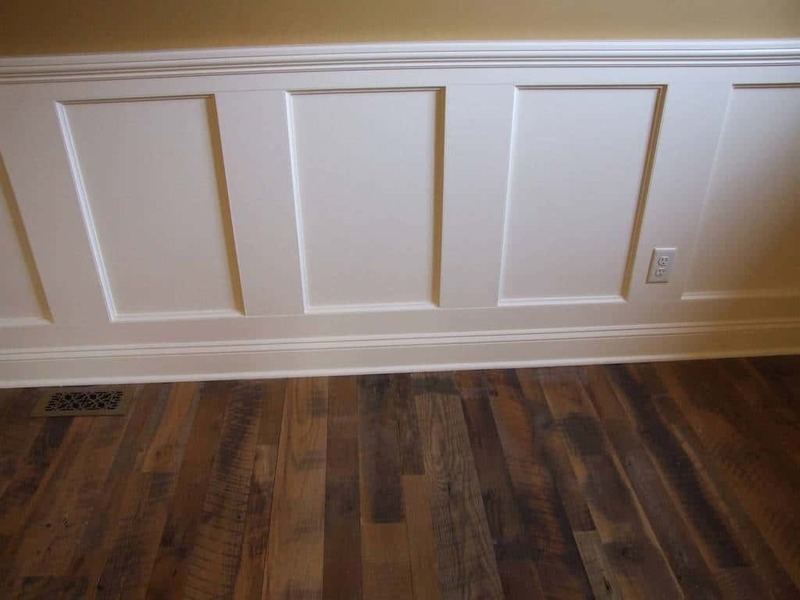 When done right, it can create beautiful trim and accent the entire room. The well designed ceiling is a cap to this wonderful space. 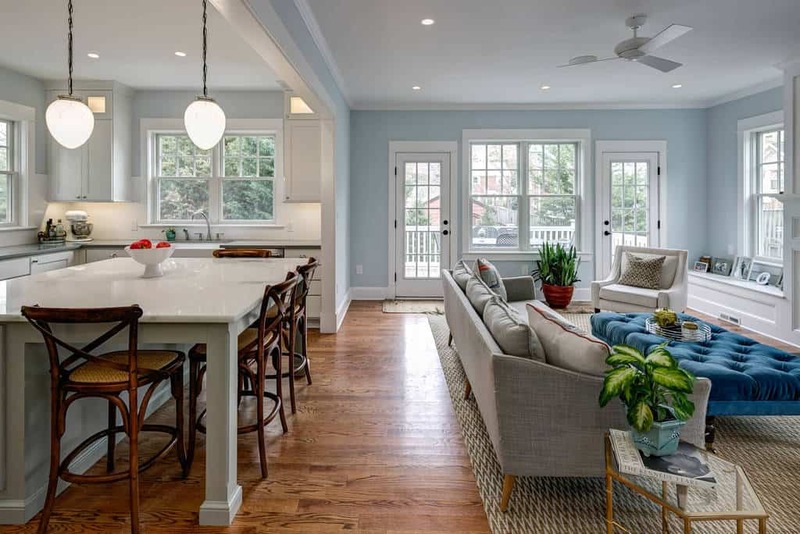 This whole area, form the family room to the kitchen and dining areas, are all connected by a fantastic hardwood floor. The natural light shines in from all around to show off the light styles of this space. Photo by Gem Builders Carpentry, LLC. With a traditional style at work to match this durable hardwood floor, you can see how many options this space will give you. With a design like this, you have a blank canvass, so create the room you love. The wonderful light and dark contrasts of this space, from the darker hardwood floor to the lighter walls and decor, work well throughout this space. The light shows off the brilliant decor and furniture. After a long day and a great meal, come to this comfortable space and enjoy a warm fire. Catch up on your favorite television shows and unwind after a long day. With a beautiful Asian sense of style, from the architecture to the minimal decor, this space is relaxing. The hardwood floor boasts two tones and sets up the beauty of this space.